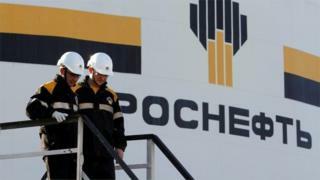 Russia's biggest oil company, Rosneft, has reported a 77% fall in third-quarter profits as a result of lower oil prices. Net income for the period was 26bn roubles ($400.7m; £318m), which was much lower than expected. UK oil giant BP owns 20% of Rosneft. Earlier this week, the Russian government, which owns around three-quarters of Rosneft, said it would sell a 20% stake in the company as part of a money-raising privatisation programme. The sale of the stake is expected to raise £9bn for the cash-strapped Russian government, whose income has suffered because of the fall in commodity prices. Rosneft's chief executive, Igor Sechin, said the "environment on the commodity markets remained difficult" during the third quarter of the year. Many of the world's largest oil companies have been reporting lower profits as the sector struggles with low crude prices. BP recently reported a near-halving of its third-quarter profits, while US giant Exxon saw earnings dive by nearly 40%. Oil prices peaked at about $115 a barrel in the summer of 2014, but then fell sharply due to a combination of increased supply and slowing demand. In October, news that the Opec oil producers' cartel had agreed a limit on production sent the oil price to its highest in a year, with Brent crude rising above $53 a barrel. However, doubts over whether Opec will be able to deliver production cuts have seen prices slip recently. On Friday, Brent crude was trading at $45.77 a barrel.